Featuring a dynamic fusion of several alternative stylistic touchstones, Snow Patrol’s compositions combine songwriting aptitude with guitar rock’s sharpest strains. Originally from Northern Ireland, Gary Lightbody (vocals, guitar) and Mark McClelland (bass, keyboards) first got together in Dundee, Scotland, where they were studying, prior to the addition of Jonny Quinn (drums), who completed the lineup. Signed to the U.K.’s Jeepster label in 1998, they released their debut album, Songs for Polar Bears, in August of that same year. The record was a large success across the U.K., where they also gained a large fan base for their live show. The British trio graduated soon after, and decided to move from Dundee to Glasgow in late 2000. Their second full-length, When It’s All Over We Still Have to Clear Up, was released in April 2001. Quickly thereafter, guitarist Nathan Connolly was added to the group, and Snow Patrol found themselves a deal with Polydor. Producer Chris Lord-Alge signed on for the release of Final Straw, which appeared stateside in April 2004. With the success of singles such as “Chocolate,” “Run,” and “Spitting Games,” Final Straw sold two million copies in their native U.K. It also became the 26th most popular British album of that year. 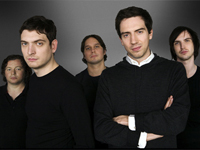 In March 2005, founding member Mark McClelland left the band to pursue other avenues, leaving Snow Patrol a trio with Lightbody, Quinn, and Connolly. Shortly thereafter, former Terra Diablo bass player Paul Wilson and touring keyboardist Tom Simpson were permanantly added to the band. An opening slot on U2′s Vertigo Tour of Europe followed in summer 2005.